When it comes to shopping for the family, it’s hard to push past Target. From induction cookers to games consoles, the store caters to suit every family member. Its pram and stroller range is just as versatile, with many of the products designed to be suitable from birth and last for years to come. Some models, including the Childcare Dual Stroller and the smarTrike Delight, are exclusively sold at Target. Certain items like the Single Upright Buggy are also only available in-store. To help you navigate your way down the aisles, we’ve mapped out the different strollers currently on offer from Target and listed a few of their features. Target’s Safety 1st Travel System Stroller is a versatile multi-function stroller which can transform a single stroller to a double or complete travel system. 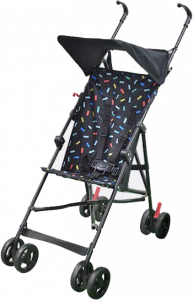 It features an aluminium lightweight tri-fold frame said to provide an easy and compact fold, and includes a carry handle to help you transport your stroller wherever you go. You can also remove the wheels for a smaller fit. Other customisable features include a 3-position backrest recline and a removable T bar. 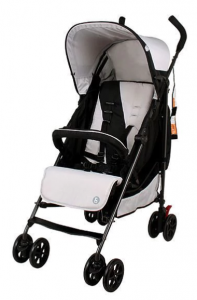 The stroller is travel system compatible and comes with infant carrier adapters. But the Safety First Infant Carrier will take you back an extra $199, which is usually the same price as the stroller itself. A large canopy with a large peek-a-boo window is similarly available so you can keep a close eye on your little one. The Safety 1st Travel System Stroller is suitable for newborns and children under the age of 4. If you’re looking for an ideal item for traveling, the Target Trip Stroller is a lightweight option suitable for newborns and young children. This typically costs $89. The model includes a multi-position backrest as well as a quilted and padded seat pad to make sure your child stays comfortable throughout the day. It also features a high density foam grip and front swivel wheels to help you keep control of the wheel. It similarly contains a self-lock and compact fold design for convenient storage. The Childcare Heston Stroller from Target is a compact model made with a lightweight steel frame, featuring a 4-position fully reclining seat and 5-point safety harness. 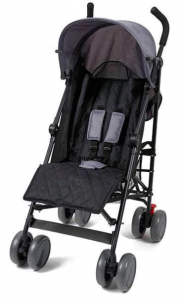 The canopy is detachable so you can customise the stroller however you need. Available for $129, this stroller has a 20kg weight capacity and is ideal for children up to three years old. The Childcare Dual Stroller is for those who like the Childcare Heston Stroller but need space for two. Suitable for newborns and toddlers, this model contains customisable safety features like a removable bumper bar and 5-point safety harness. Cable linked rear-brakes with a separate release pedal are also available for convenience. If you’re searching for something to give you more control, this stroller has a reversible handle as well as swivel and lockable front wheels so you can push the stroller more comfortably and smoothly. The Childcare Dual Stroller has a weight capacity of 17kg. Similar to the Childcare Heston Stroller, this model is priced at $149. The Single Upright Buggy is a suitable option for parents who are planning to take their child on quick errands, thanks to its lightweight and compact design. It includes a 5-point harness to keep them secure, and front swivel wheels for manoeuvrability. Valued at $25 this is least expensive stroller available from Target. The Single Upright Buggy is ideal for children aged 6 months and older. If you’re looking for something more affordable, the smarTrike SmarTfold collection typically ranges between $49 and $199. The SmarTfold 400 7-in-1 Folding Trike is ideal for parents who want something to support their child as they grow from baby to toddler. Featuring a unique Touch Steering technology which allows the trike to move like a stroller, this is suitable for children aged between nine and 36 months. The model is said to help kids develop confidence, balance and motor skills as they eventually learn to pedal on their own. The smarTrike Delight and smarTrike Fun 2 in 1 are similarly available for children. These two models can switch between Touch Steering and child-ride control mode, so your little one can ride on their own or with the help of mum or dad. The smarTrike Fun 2 in 1 even comes with a basket for toys to keep your child entertained on busy days. The smarTrike Delight is suitable for children aged between 10 and 36 months, while the smarTrike Fun 2 in 1 is ideal for kids aged between 15 months and 24 months. Does Target hit the spot when it comes to strollers and prams? Cruise your way into Target and find a range of compact and lightweight strollers to suit your family. From newborns to toddlers, Target’s strollers contain customisable features that can adapt your stroller to as your child grows. The various strollers include the Safety 1st Travel System Stroller, Trip Stroller, Childcare Heston Stroller, Childcare Dual Stroller, Single Upright Stroller and smarTrike. Most of the products available can be used from birth and are suitable for once they reach the age of three or four. Items like the Safety 1st Travel System Stroller, Trip Stroller and Childcare Heston Stroller feature multi-position seats which can be adjusted depending on their size. If you’re a parent to twins or siblings, or planning a new addition to the family, the Childcare Dual Stroller or the Safety 1st Travel System Stroller may be suitable for you. 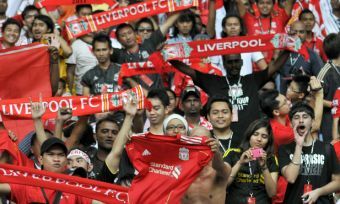 Both can accommodate two children of different ages. 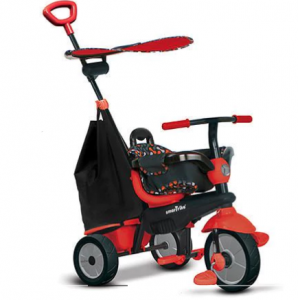 The smarTrike range is similarly made to support your kid at each stage of their development. The SmarTfold 400 7-in-1 Folding Trike is a storage-friendly trike which can help your baby develop balance and motor skills as they train to pedal they train to pedal. Once they get older, they can change their set of keys to the smarTrike Delight or the smarTrike Fun 2 in 1. These allow your toddler to continue developing confidence and skills the need to ride solo. As most of the strollers are described as lightweight and offer a compact fold, Target’s range may be suitable for families who use public transport or who may be short on space. 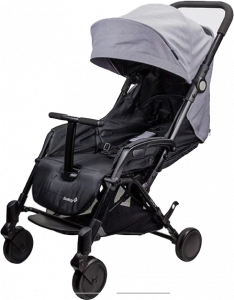 Products like the Childcare Heston Stroller and Safety 1st Travel System Stroller may be especially useful as these allow you to remove items like the canopy or wheels to further reduce the bulk. Shopping for the perfect stroller isn’t a walk in the park. This is why you should check out the Canstar Blue website for plenty of ratings and reviews on a wide range of prams and strollers, as well as other baby essentials, to find what’s best for you.